Here on homify we just love it when a simple space presents numerous possibilities, not only in terms of function, but also design. 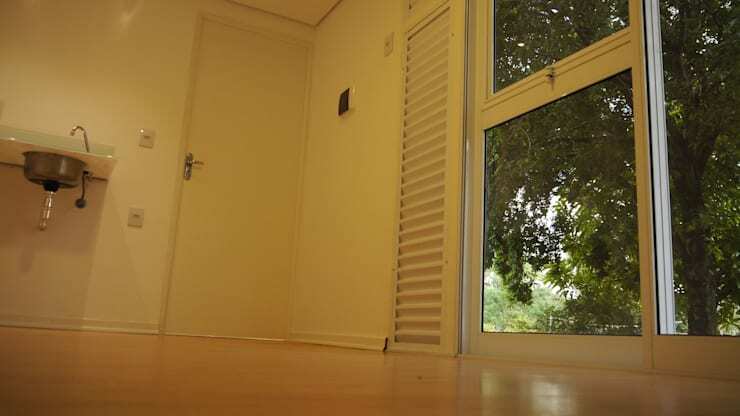 That’s why we were quite happy to stumble upon this container home by Casa Container Marilia, architects who specialise in creating homes (and other spaces) from old shipping containers. Flaunting a not-too-shabby size of 6 × 2.6 × 2.5 m / 15 m² (length, height, width / area), this design presents countless possibilities – so let’s check it out and come up with a few suggestions! Don’t you think this little design could fit in just about anywhere? The beach, the woods, your own back yard… Look at that metal façade that’s been styled up with some paint, shutters, adequate holes for doors and windows (complete with frames), a few potted plants and even a little wooden deck at the front! On the inside, this container structure enjoys a rather cosy look and feel thanks to the wooden floors and light-hued walls and ceiling. Ample indoor light is ensured not only through the artificial lighting fixtures, but also the windows and glass doors. But how does the layout work? 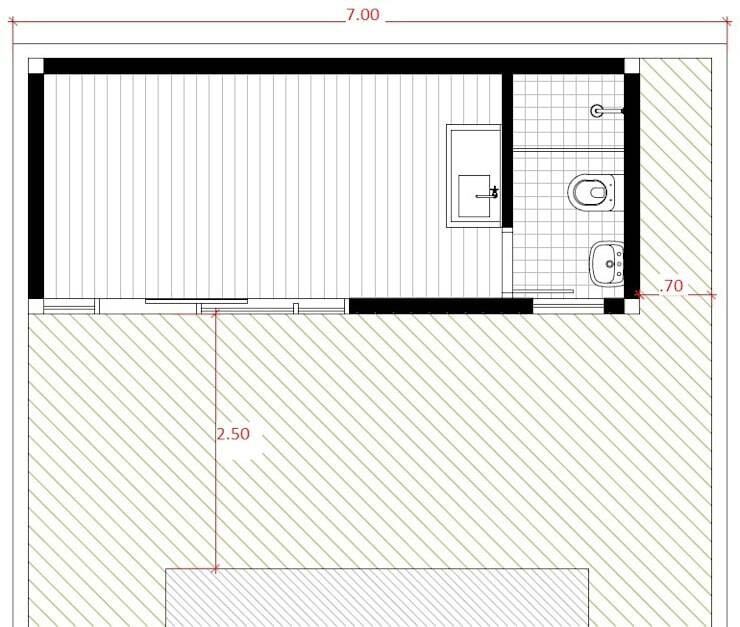 From this architectural floor plan, we can see how practical the container home’s layout works. The right side presents a bathroom complete with all the requirements (a sink, toilet and shower), while the bigger space on the left provides ample room for… well that’s where you come in. What would you use this little guy for? We’ve got it: a guest bedroom! Imagine getting yourself one of these containers, moving it to the back garden, and styling it up as a guest bedroom – complete privacy for guests who are spending the night at your house, or a moody teenager who just has to have his/her own space! On the other hand, your own private study/home office could also work. You’ll have your own bathroom, plus ample legroom for movement, not to mention adequate space for bookshelves, a desk, some chairs and even your own little kitchenette for whipping up snacks and coffee. 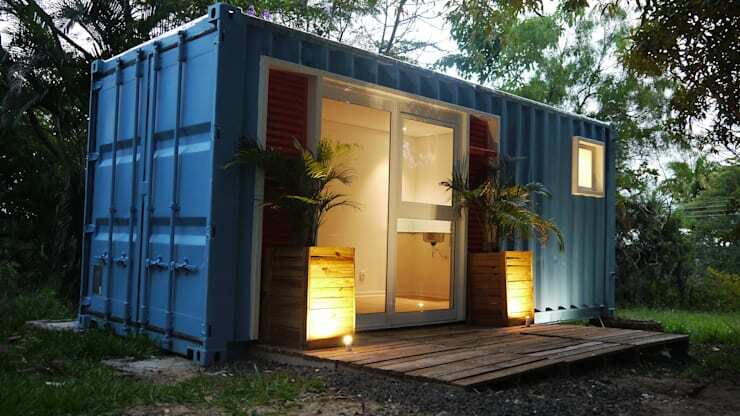 While you come up with some more ideas, feel free to check out these 7 container homes built for next to no money. So, what would you use this container for?